Originally, when I thought about cooking this weekend, I thought first about doing split pea soup. This was primarily because we had a ham bone left over from a dinner a few months ago, and I always love making soup out of it. 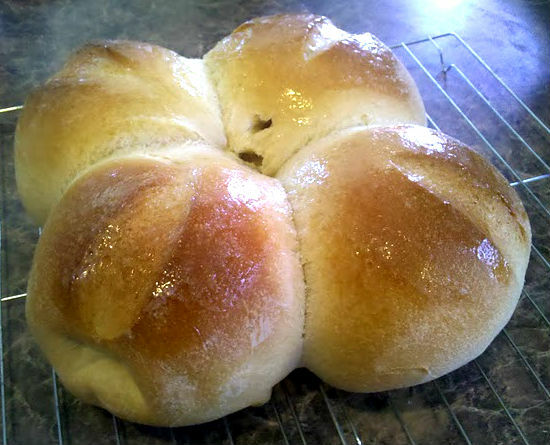 I was also itching to make some bread, and a type that I wasn’t used to, either. So, I busted out my “Bread Baker’s Apprentice” by Peter Reinhart, and started looking it over. I chose to do the Italian bread. Italian bread is an “Indirect” bread, according to Reinhart, meaning that it has a preferment before the main mixing phase. In this case, I chose to do it overnight. ¾ cup to 1 cup water at room temperature. I mixed the ingredients above in a bowl, then turned them out onto a floured tabletop and kneaded for a few minutes until it all came together. At this stage, I didn’t worry too much about it forming a windowpane. I just wanted it to feel smooth, like a bread dough in and of itself. Then I oiled it, and put it under plastic wrap in a bowl. I put it in the fridge overnight. If it hadn’t been so late at night when I made the Biga, I actually would have set it out to rise for a couple of hours, and then put it in the fridge. The next morning, I took it out of the fridge and set it out to come back up to room temperature. At that point, I chopped it up into about 10 pieces. I gathered the ingredients for the main dough mix. I mixed all of the ingredients in a bowl, then dumped it out on the floured counter and began kneading for real. I kneaded for almost 20 minutes, and at that point I got a good windowpane. I set that aside to rise on the countertop. This time, it rose quite well. After only about two hours, it was ready to shape. Before I degassed it and began working it, however, I got some coals lit. Then I came in and shaped the dough into four equal quarters and made them into boule shapes (balls). I put these in a square configuration on a piece of parchment on a plate. Soon the coals were hot, and I put an oiled dutch oven on and under a lot of coals, probably a total of about 30, with an oven thermometer inside. After about a half hour, it read 350 degrees. I probably should have let it heat for another ten to fifteen minutes, to about 400 at least, but I didn’t. The dough had proofed up nicely, and I was nervous about them cooking fully before church. I lifted the dough balls up by the parchment paper and lowered them into the dutch oven. I closed the lid and marked the time. After about fifteen minutes, I rotated the oven and the lid, so that it was positioned differently in relation to the coals (to prevent hot spots on the oven). I also peeked in, and inserted a thermometer into the now cooking bread. It didn’t spring up like I would have liked, and that’s why I think I should have heated up the oven hotter. After about another 20 minutes, the thermometer read 200, and I knew it was done. I pulled it off the coals, and dropped the bread onto my cooling racks. It was at this point, that I told my son that I was going to cook the pea soup, and he suggested using the bread as bowls. They were the perfect size, and shape. It was brilliant! So, next entry, I’ll write up the soup, and show you the bread bowl results. I need to try this:) Thanks for taking the time to post this.